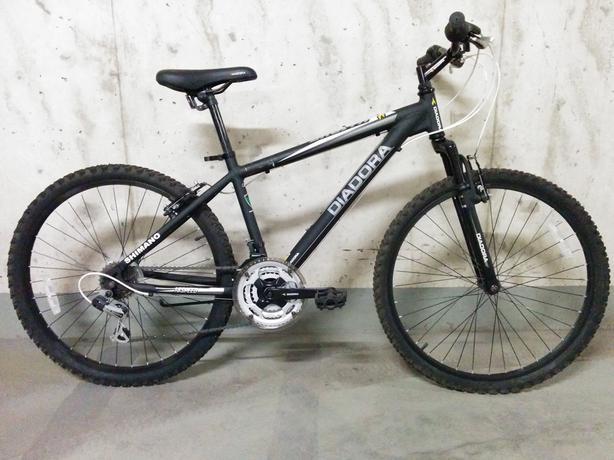 I just began biking around 4 months ago, and due to lack of experience I bought a Diadora Orbita Mountain Bike. I've staring commuting to work recently (about 14 km daily) but I'm not exactly happy with my speed (around 17 kmph with no traffic) that is after inflating my tire and cleaning the chains on regular basis... Would changing the tires into thinner ones make my any bike faster? Are there any other modifications that I can apply to my bike to make it go faster? Or would be easier to just buy a road bike instead? I started commuting the same way about 8 months ago on a 29'er mountain bike, 2 things made the trip faster and more enjoyable. Firstly tyres, I changed from knobblies to slicks and it made a BIG difference both in feel and actual speed. Secondly I got a lot stronger from biking every day. I eventually got a lighter cheap touring bike which is faster, and better in many ways, but I still prefer the mountain bike for fun. Condition-specific bike - road bikes are lighter, geared better and handle better on roads, no question. Not necessarily thinner tyres, but ones with less tread will make a difference. If you are commuting by road only, then putting on some 'slick' tyres will cut a lot of the wind resistance, and rid you of that whirring noise as the tread nobbles whiz through the air. I've had my rigid mountain bike up to 76 Km/h on slicks (but that was down hill). About the only other thing to try is locking the front suspension forks so all your pedaling energy goes into forward motion, not bobbing the forks up and down. If you can afford to change to a road specific bike, it will be faster, and having a clean bike for commuting is way easier than cleaning a dirty mountain bike at the end of the weekend and changing the tyres back to slicks. Firstly, don't be too disappointed with that as an average speed. It takes a surprising amount of time to build up cycling fitness and pedalling technique, with many cyclists saying that during their second year after starting regular cycling they were still seeing big improvements. The most significant improvement in speed you'll see if you keep cycling regularly will be down to your improving cycling fitness. The next two biggest factors limiting your speed are likely to be aerodynamics and tire rolling resistance. The aerodynamics of the bike are difficult to change and usually small compared to the aerodynamics of the rider. So consider tighter-fitting clothing instead of a baggy jacket. This is especially important when going downhill or into a headwind. Switching to slick tires will make a definite and noticeable improvement. If part of your journey is off-road you may want to consider semi-slick tires. I think that all other upgrading of parts, cleaning the chain, etc, will make a very small difference in comparison to the suggestions above, so I'd recommend trying those things first. Some good suggestions here, including tires and either toeclips/straps or clipless pedals. One question that hasn't been touched on : are you in the right gear? If you are either pedalling fast against no resistance, or pushing hard but turning the pedals slowly, you are in the wrong gear, and learning the right gear for you (or the right gear for each uphill or downhill section) will help your average speed. Perhaps experiment with a slightly higher gear than you normally use one day, and a lower gear the next, and see how your time - and comfort - compares. If you always find yourself in the top (or bottom) gear, or one gear is too low but the next is too high, then (with a bike shop's help) you can improve the gearing on your bike for a fraction of its cost, by replacing the block or one of the chainrings. Another : Are the saddle and handlebars at the right height? If your knee is still bent at the bottom of your pedal stroke, try raising the saddle half an inch at a time - when you get to the right position, 1/4 inch either way makes a big difference. Saddle fore/aft position and handlebar position also make a difference, but less spectacularly so. If you're up for a weekend project, you could add a geared electric motor to your bike. A 500w motor and battery will run you about $750 and a 1000w setup will cost around $1250. Mountain bikes are the most common bikes to put electric motors on because of their comfort and suspension. I put a 1000w motor on my road bike and it averaged 25mph with minimal pedaling effort. Tires will make a difference and are probably worth a try, along with light weight tubes. The bike will still be heavy, with heavy wheels and low quality components including bearings. Don't expect too much from a bike of that specification level. Upgrading the bike to a better MTB or road bike (depending on if you need a MTB) would make a much bigger difference. You can probably sell the bike you have and buy a used one more suited to your needs for less than upgrades will cost and would IMHO be a better way to approach this. If you want to go cheap, change to non-knobby tires. Believe me (and my many miles of painful experience), it would make a big difference. Barring that, a hybrid, or better, full-on road bike make a bigger difference. Be sure to consider your average miles per ride, which equals time in the saddle, your tolerance for speed vs. comfort, and yeah, budget. My Odyssey began with a cheapo Schwinn road bike from Target before I graduated to "real" bike brands with aluminum, steel, carbon and finally, titanium frames. Point is, if you don't want to blow all that money like I did on bikes, try to educate yourself on what the best ONE (or two) bike(s) would be based on your needs. I, like others in this thread was in a similar position. What i ended up doing was to buy slick tires and changed to a road cassette for tighter gearing. I considered buying a road bike but because I cycle in London you're pretty much always starting and stopping, so frame weight doesn't really matter all that much, and it makes cleats a nuisance more than anything. Also road bikes have really rubbish brakes compared to my hydraulic discs. You can start by looking at your gear ratio and change your sprocket size. Hit a local bike shop and they should be able to find a fit for your crank. Usually they are universal to fit on any bike. Not the answer you're looking for? Browse other questions tagged tire speed beginner or ask your own question. Are slick tires worth it for commuting? How to fix a sluggish bike? Can I ride faster with a bike jersey? Will increased weight make me go downhill faster? Faster with lower center of gravity?